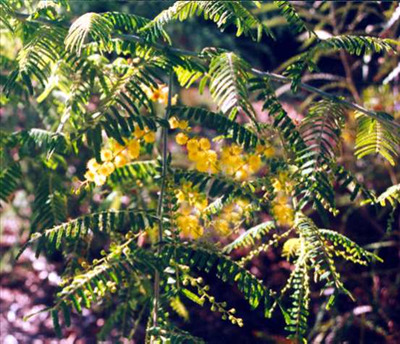 Small to medium tree 18-45', with pendulous branches and large pale yellow round flowers in winter. Beautiful in flower. Prefers well-drained soils. Will tolerate light frost. Grows naturally alongside creek beds and gullies in northern NSW and Queensland. It has bluish-green fern-like foliage. Flowers are highly perfumed. Excellent fast growing tree for large gardens and parks.